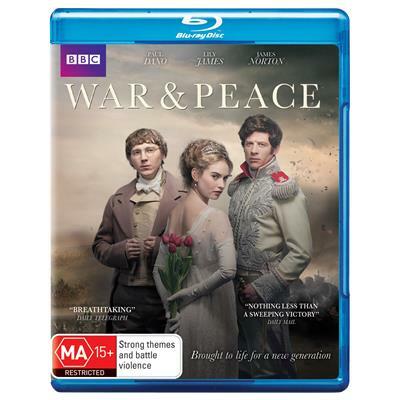 ���� War & Peace by Leo Tolstoy is considered to be one the great novels and has been made into movies and television series a number of times over the years. Probably the best known ones are the 1956 movie starring Audrey Hepburn and Henry Fonda, the 1966 7 hour Russian epic movie (which won the best foreign language Academy Award) and the 1970s BBC series starring Anthony Hopkins. Now, in 2016, the BBC has had another tilt at creating a mini-series of this story, which is the subject of this review. It was shot in Lithuania, Latvia and Russia using Arri Alexa Digital cameras. The production is of very high quality featuring marvellous cinematography, wonderful costumes and music and high quality acting from a diverse ensemble cast. ���� For those not familiar with it the story is set at the time of the Napoleonic Wars, from a Russian perspective. It follows five Russian aristocratic families, their lives and loves, tragedies and setbacks during a period of about seven years from 1805 to 1812. The first family is the Bezhukov's. They are very wealthy and the subject of who will inherit old Count Bezhukov's estates and money once he dies kicks off the story. Among the candidates are his illegitimate son, Pierre Bezhukov (Paul Dano), who is a bit of a buffoon is society circles, spending a lot of his time drinking and carousing. Another claimant is Prince Vassily Kuragin (Stephen Rea) who is related to the old Count by marriage. His is the second family in the story consisting of himself and his two children, Helene (Tuppence Middleton), who later marries Pierre and Anatole (Callum Turner), his womanising son. Another claimant comes from a third family, Anna Drubetskaya (Rebecca Front) who is desperate to get her only son, Boris (Aneurin Barnard) well positioned in life. In this version of the story, this family is probably least mentioned. The fourth family is that of Count Illia Rostov (Adrian Edmondson). They are initially well off but as the story progresses their financial position wanes. Important characters in this family include his wife Natalya (Greta Scacchi), his older son Nikolai (Jack Lowden), his daughter, Natasha (Lily James) and her cousin/companion Sonya (Aisling Loftus). The final family is probably the richest, led by the irascible and domineering Prince Nikolai Bolkonsky (Jim Broadbent) and including one of the heroes of the story Prince Andrei, his son (James Norton) and his homely but caring daughter, Princess Marya (Jesse Buckley). Other important characters who are involved with or attached to the main families include Fedya Dolokhov (Tom Burke), a philandering rake, Colonel Vassily Denisov (Thomas Arnold), a war hero and friend of Nikolai Rostov, Anna Pavlova (Gillian Anderson), a social leader in Moscow and General Kutusov (Brian Cox), leader of the Russian Army and a mentor to Prince Andrei. The story is driven by the various interactions, romances and intrigues between these families and characters. ���� For such a huge sprawling novel, six hours is still probably a little truncated in terms of telling this story. The Russian film is seven hours and the previous BBC series was done over 15, one hour episodes. That does not mean, however, that the story is told badly in this series. The series kicks off being a little hard to follow for the uninitiated as so many characters are introduced so quickly, however once you get the hand of it they become easier to follow. The ensemble cast is marvellous with Paul Dano and James Norton both excellent as the two who are probably the main characters. Dano is an interesting choice for this role as he does not have the physical size of the character in the book, however he does a great job of portraying the large character arc of a person who finds themselves multiple times during the story. Other standouts in the cast are Jim Broadbent as the grumpy and domineering Prince, Adrian Edmondson as the optimistic and overly generous Count Rostov and Tuppence Middleton as the conniving and reprehensible Helene. ���� Technically, this is also a major achievement with spectacular cinematography including lots of great establishing shots and landscapes which really place you in Russia. The writing by English television veteran, Andrew Davies is marvellous, condensing the story without losing its essential components. The music by Martin Phipps, combined with some classical pieces and Russian choral music is also a star of the production. The costumes are also marvellous as you would expect for a major period production. My only real criticism would be that although the battle scenes are generally really well done there are some moments where you feel that smoke is used to hide the fact that a major battle like Austerlitz only seems to have a small number of people involved in it during filming. I understand that you cannot necessarily afford the people and/or effects required but it is just a bit obvious at times. ���� For a new release Blu-ray of a major television production this video transfer is quite disappointing. It is variable with some sequences really quite ordinary reminiscent of DVD, featuring colour bleeding, a lack of detail, pale faces, digital smoothness and a lack of sharpness. This is especially true early on in proceedings. Indoor sequences are especially afflicted in this way with significant light colour bleeding from windows etc., but also bleeding of other colours and chroma noise at times. Outdoor shots fare much better but are still not as sharp and clear as they should be. I would guess that the whole set is afflicted by low bitrates for Blu-ray. Technically it is 1080i at 1.78:1, which also leads to some motion blur due to the interlaced presentation. It is hard to know whether these issues are due to the technical encoding or the original shooting but regardless it is underwhelming. ���� There are subtitles available in English, which are clear and easy to read. ���� Unlike the video, the audio is marvellous for a television production with lots of subwoofer for explosions and war sequences and good use of the surrounds for music, atmosphere and the madness of battle sequences. It is encoded in what seems now to be the Blu-ray standard of DTS HD-MA 5.1. Dialogue is clear and easy to understand throughout. The music sounds marvellous, showing off the wonderful score. The choral music really fills the sound field during the credits and at other times. ���� Seven extras which do not add up to much more than the length of a short making of. ���� The menu featured music and scenes. ���� Andrew Davies discusses the script, his writing approach, the use of stage directions and more. Probably the best of the extras. ���� Featurette on the Latvian Palace used during filming. ���� Footage of the initial script readthrough with the cast with interviews. ���� A short featurette on the composer and his approach to writing the music and its recording. ���� Very short set of interview snippets with the cast talking about their views on the story. ���� Adrian Edmondson discusses his dance sequence in the film. ���� A minor set of short deleted scenes which would not have added much. � � This series is not yet available outside of Region B but is due for release in the US in May 2016. Buyer beware the version shown on US television was cut to allow for more commercials so I would suggest a Region B purchase. Buy local for now. ��� A high quality, well written and acted adaptation of the classic novel. ��� The video quality is disappointing. ��� A selection of short extras. Display Sharp LC52LE820X Quattron 52" Full HD LED-LCD TV . Calibrated with Ultimate DVD Platinum. This display device is 16x9 capable. This display device has a maximum native resolution of 1080p.